From among the saints commemorated on the 21st of April, we especially remember the life and works of Hieromartyr Januarius, Bishop of Benevento and his companions, at Pozzuoli. Hieromartyr Januarius Bishop of Benevento, and the deacons Proculus, Sossius and Faustus, Desiderius the Reader, Eutychius and Acution suffered martyrdom for Christ about the year 305 during the persecution ordered by the emperor Diocletian (284-305). 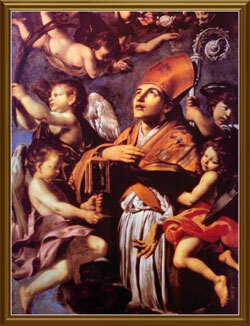 They arrested Saint Januarius and led him to trial before Menignus, the governor of Campagna (central Italy). Because of his firm confession of Christianity, they threw the saint into a red-hot furnace. But like the Babylonian youths, he came out unharmed. Then at Menignus’s command, they stretched him out on a bench and beat him with iron rods until his bones were exposed. In the crowd were Deacon Faustus and the Reader Desiderius, who wept at the sight of their bishop’s suffering. The pagans surmised that they were Christians, and threw them into prison with the hieromartyr Januarius, in the city of Puteolum. At this prison were two deacons who had been jailed for confessing Christ: Saints Sossius and Proculus, and also two laymen, Saints Eutychius and Acution. Since the fifteenth century, the blood liquifies when the container is placed near another relic, believed to be the martyr’s head. Many miracles proceeded from the relics of the hieromartyr Januarius. During an eruption of Vesuvius around 431, the inhabitants of the city prayed to Saint Januarius to help them. The lava stopped, and did not reach the city.